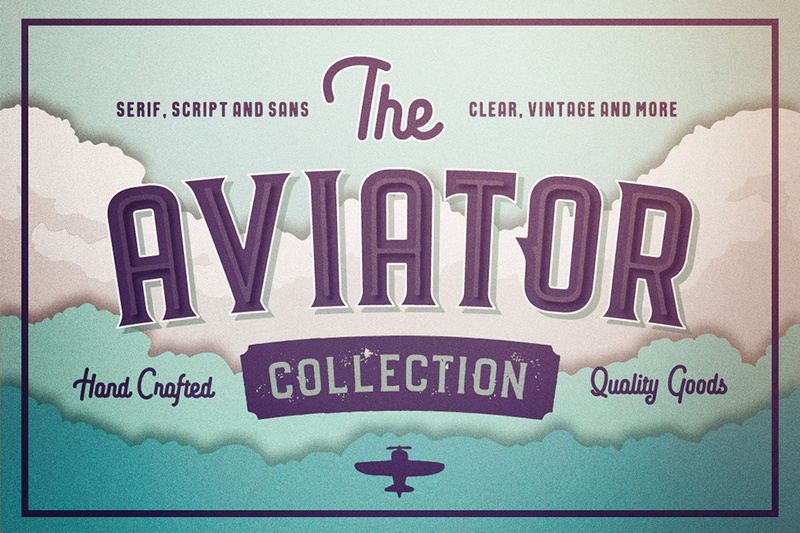 The Aviator Font Collection	By: Vintage Voyage Design Co. The Aviator Font Collection is a type collaboration of four different vintage fonts in 100% awesome vintage style! Create your own vintage style – Elegant Clean or Distressed Letterpress. And that’s not all – 52 vintage illustrations for logo creation and awesome tools – a Vintage Badge Creator! Just install all these font files and create your own stuff. These are perfect for Logos, Advertising, Apparel Design, Labels, Posters, Package Design, Signage, Etc. The three typefaces come in two styles: Clean and Aged (Distressed Letterpress) and Script come in one style – Clean. All of the Aviator Collection comes with Western European characters. File size is approx 1010.2KB(2.5MB unzipped), offered as a single download. Wow! That is a great font set. Thank you Design Cuts! Thank you Vintage Voyage Design Co.! Thank you so much for taking the time to leave such a lovely comment Melinda! Aww thank you so much for your lovely comment Christine! We are so pleased to hear that you love these fonts and hope that you have great fun taking your new goodies for a spin! Happy Friday! Great freebie! I almost missed it – thankfully you guys are very generous and give us reminders! Woohoo we’re so glad that you managed to pick this one up in time Randall! Awesome font collection. Thanks so much for this week’s freebie! Woohoo thank you so much Lisa, your support means so much to us! We hope that you have great fun taking all of your new fonts for a spin! Aww thank you so much for your lovely comment Jutta! Gracias amigos, por eso estoy suscrito a ustedes! Aw thank you so much Miguel, your support means so much to us! Love this, thanks so much!! I hope that you really enjoy working with your new resources! Many, many thanks. How very generous! You are so welcome Debie and thank you so much for your comment! We hope that you have great fun taking these for a spin! I loved it !!! Thank you very much! Wow! Thank you so much Vintage Voyage Design Co. & Design Cuts for this amazing Free baby bundle! Sadly, I missed the fabulous Definitive Font Selection Bundle and had really wanted this major-ly cool font family. So, now I’m off hippity scopity to see what groovy creations are waiting to be born by this gracious freebie! Thank you!!!! We are so sorry to hear that you missed The Definitive Font Selection Bundle but are thrilled that you loved being able to pick this one up as our new Friday Freebie 🙂 We hope that you get great use out of all of your new fonts and are feeling inspired for some groovy creations! Love the font. Thank you, DC and to the Vintage Voyage Design Company. And – as always – happy weekend everybody! Aw thank you so much Ulrike, this is awesome to hear! Thank you so much for taking the time to leave us a lovely comment Madeleine! Great font! Thanks for sharing! You’re so welcome Markus, Happy designing!